Bimini road is made up of limestone blocks with most of them cut in a rectangular shape. Wikimedia CommonsNorth Bimini Island, where Bimini Road is located. For hundreds of years, the story of the sunken city of Atlantis has graced the pages of novels and captured the attention of historians and fantasizers alike. The famed lost city makes its first appearance, in Plato’s Timaeus and Critias, as the antagonistic opposition to the Athenians. As the story goes, after a battle unlike any before, the Athenian’s defeat the Atlanteans. This causes the Atlanteans to fall out of favor with the gods, and the story ends with Atlantis sinking into the sea, lost forever. Of course, as with many ancient texts, the story of Atlantis should be taken with a grain of salt. Ancient philosophers tended to embellish, favor allegories, and create pseudo-historical accounts in order to get a point across. Yet, the story of Atlantis continued to pop up throughout historical literature, and even throughout the 19th century, causing many historians and archeologists to wonder; could this city have actually existed, and if so, where is it now? 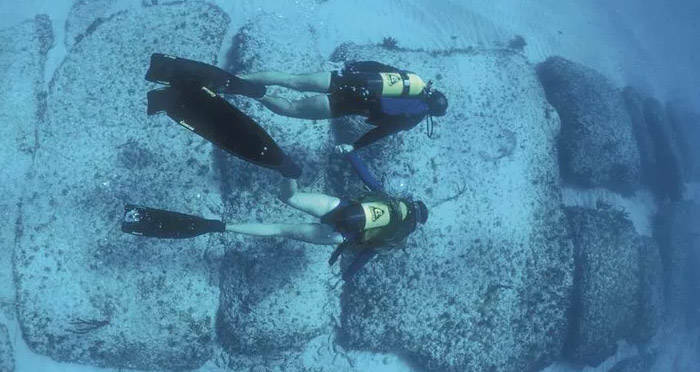 YouTubeDivers hover over the stones of Bimini Road. 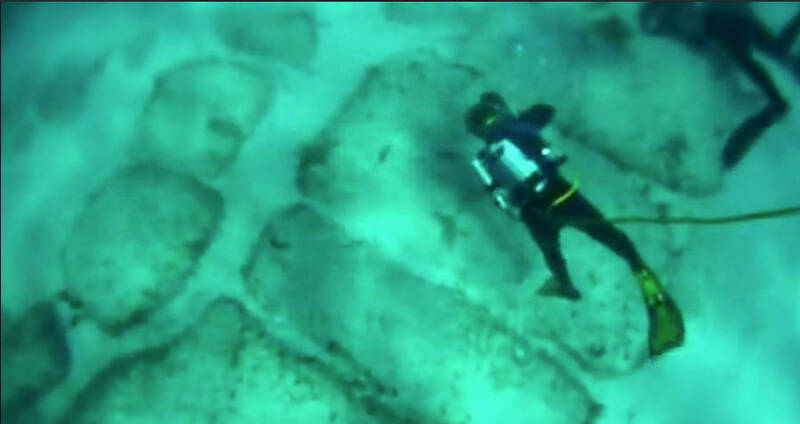 One of the most compelling pieces of archaeology put forth by Atlantean believers is the Bimini Road. 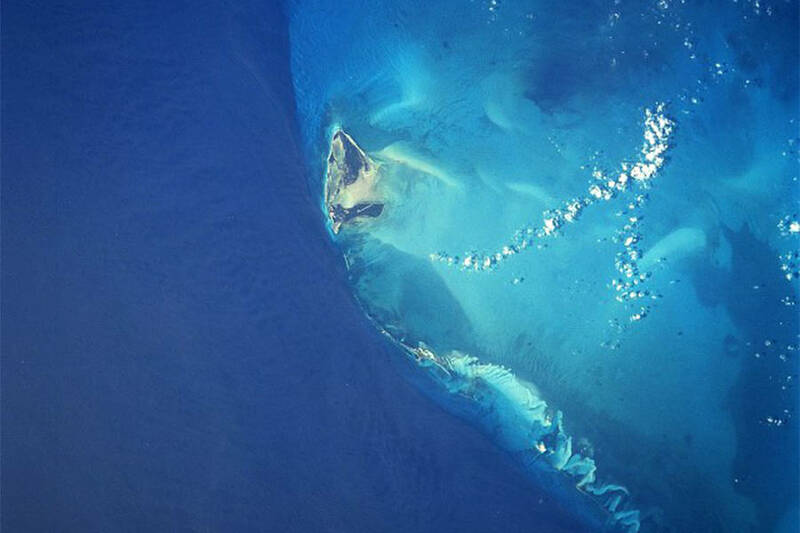 Sometimes referred to as the Bimini Wall, the Bimini Road is an underwater rock formation located just off the coast of the Bahamian island of North Bimini. 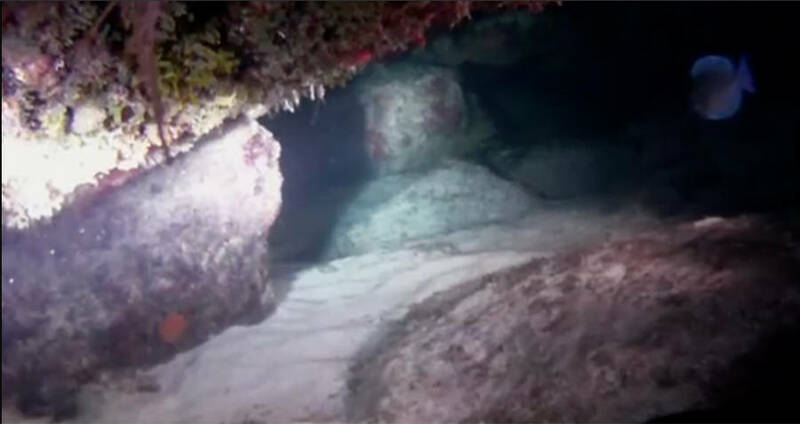 The road rests on the sea floor about 18 feet below the surface. Set on a northeast-southwest line, the road runs straight for about half a mile before ending in a curving, graceful hook. Alongside the Bimini Road are two other smaller linear rock formations, that appear similar in design. The Bimini Road is made up of limestone blocks, most of them cut in a rectangular shape. Most of them appear to have been originally cut with right angles, though time underwater has weathered them into a rounded shape. Each of the blocks on the main road is between 10 to 13 feet long, and seven to 10 feet wide, while the two side roads have smaller, but equally as even blocks. The larger blocks appear to line up with each other, and be arranged in size order. Some of them even appear to be stacked, as if propped up intentionally. The limestone that makes up the Bimini Road rocks is specifically a carbonate-cemented shell hash known as “beachrock,” and is native to the Bahamas. When the road was first discovered, in 1968, the divers who found it described it as “pavement.” Subsea archeologists Joseph Manson Valentine, Jacques Mayol, and Robert Angove then discovered that what they thought was a long continuous rock was actually smaller stones arranged in a linear formation. As they brought their discovery to other archeologists, speculation began to arise that this road had not come about naturally. A support rock holding up the stones of Bimini Road. Given the road’s location, and it’s eerily perfect formation, many Atlantis believers and even a few archeologists have suggested that this could be a road to Atlantis. In addition to resembling a road, and having similar features as roads from the era, the Bimini Road itself was mentioned specifically 30 years before it’s discovery. In 1938, American mystic and prophet Edgar Cayce predicted the discovery of a road that led to the ancient temples of Atlantis. In addition to specifically mentioning the road, Cayce gave hundreds of prophecies regarding the Atlanteans and was a firm believer that the city would one day be uncovered. Other believers point out that the road could just be the tip of the Atlantean iceberg. After all, throughout history, entire civilizations have been wiped out by tsunamis, volcanos, earthquakes and other natural disasters only to be discovered with something as simple as a road, or a pot, or a piece of art. Why should Atlantis be any different? Of course, aside from the linear arrangement of the stones, and Cayce’s prediction, there are no hard facts that determine Bimini Road’s authenticity. Most archeologists point out that since the limestone occurs naturally it was likely there from as early on as the island itself, and that the ocean currents simply could have washed away for discovery. Carbon dating also suggests that the blocks occurred naturally – though who’s to say that ancient Atlanteans had no hand in rearranging them? Next, check out these satellite images of the lost city of Alexander the Great. Then, check out these seven other lost cities.